We are very competitively priced for the huge range of flexibility and quality we offer. If however you have found a more competitive price. Simply send us the following. 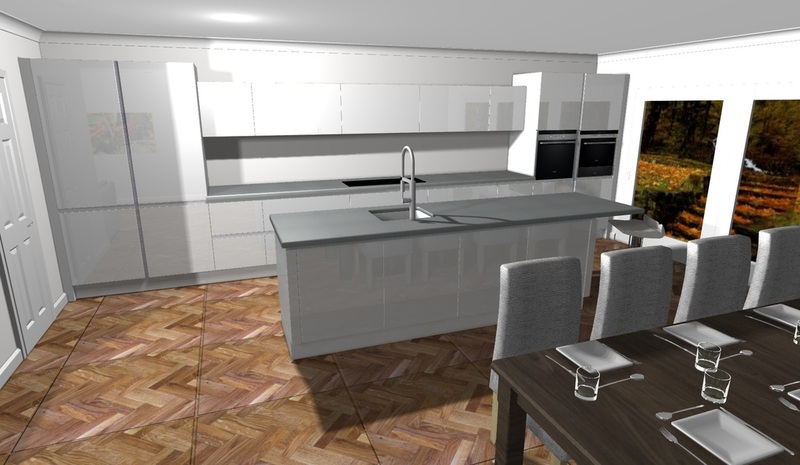 How the detailing of your handleless kitchen can affect its price. A kitchen can be designed in many different ways. 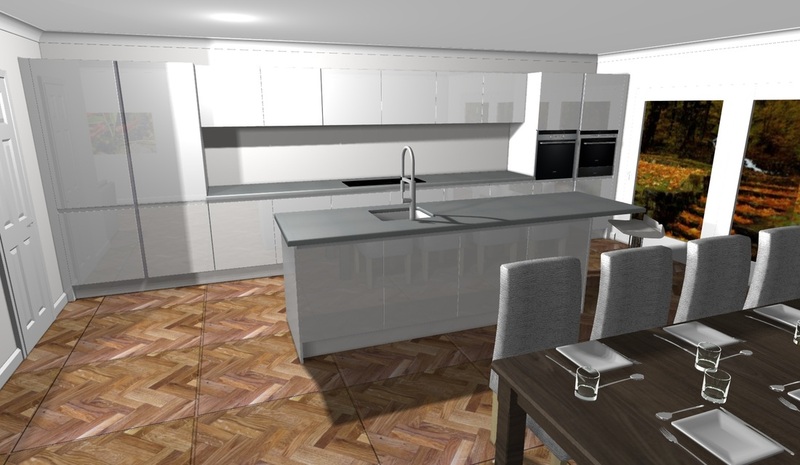 The way in which we design your kitchen is governed by your requirements as our client. The example below show how differently the costs of cabinetry can vary depending on the style and layout of basically the same size kitchen. One long run with 2.8m x 1m island. Drawers on the hob run with internal hidden top drawer. Internal kessebohmer wirework within the tall larders. Handleless rail continuing around the island on the side panels. Standard larders without internal pullout drawers. Standard base cabinets on hob run (NO DRAWERS). Standard island cladding, NO HANDLELESS PROFILE RUNNING AROUND THE SIDES. As you can see from the examples above, the amount of tall housings and the mechanisms within can change the cost dramatically. Drawers although are more practical than a standard cabinet, as you are able to view the entire contents of the drawer from above are at least twice the price of a standard cabinet. Wall cabinets - depending on the look you are after, top opening wall cabinets do create a wow factor, especially if they are servo driven (automatic motorised opening and closing). Again this can increase the cost of cabinetry from our standard wall cabinets which are available in a variety of sizes. Choice of doors. The majority of our doors are very similarly priced (Next generation ZOOM Laminates and acrylic gloss doors). Bespoke matt painted any colour you like are slightly more. Coloured glass, veneers and ceramic doors are in the highest price band as the raw materials are considerably more expensive and time consuming to produce. However they still offer real value for money for a fully bespoke kitchen. Detailing - Additional detailing of things like walnut or wenge chunky cladding creates a beautiful aesthetic feature but has no practical purpose. 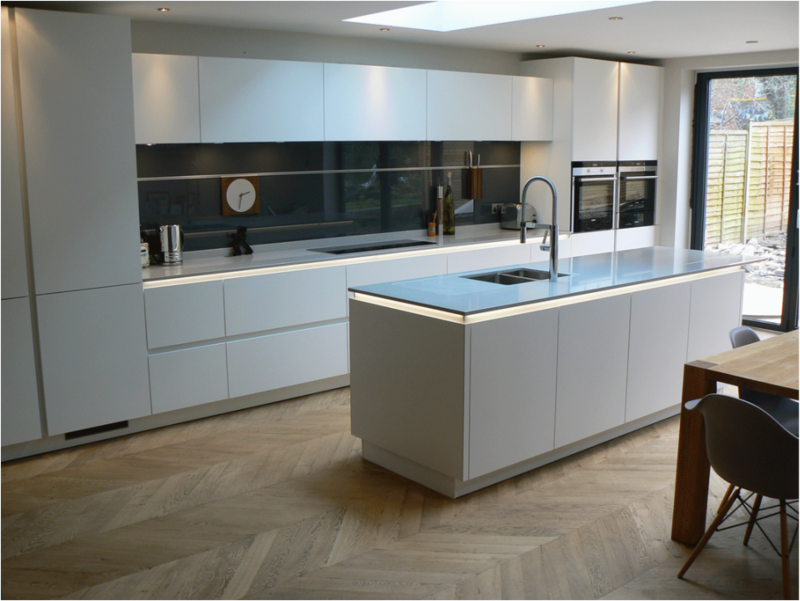 Glass splashback with recessed rail for hanging knives and clock. 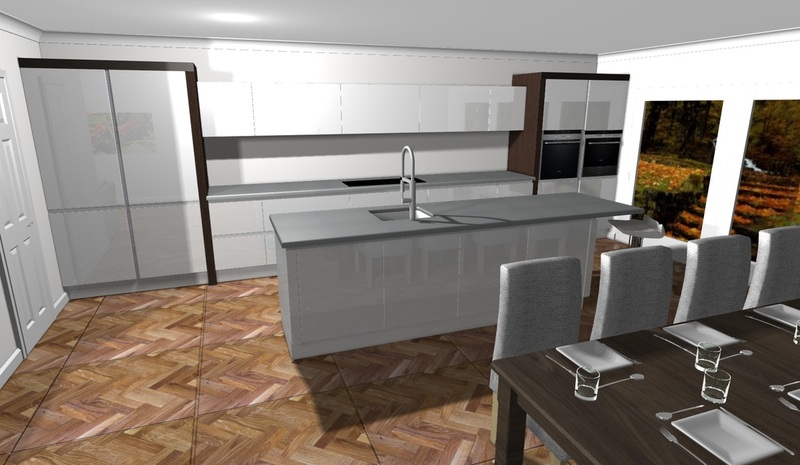 We are one of the largest manufacturers dedicated to the production of handleless kitchens, therefore we are also one of the most flexible and economical. Please feel free to send us a copy of your plans for us to quote.